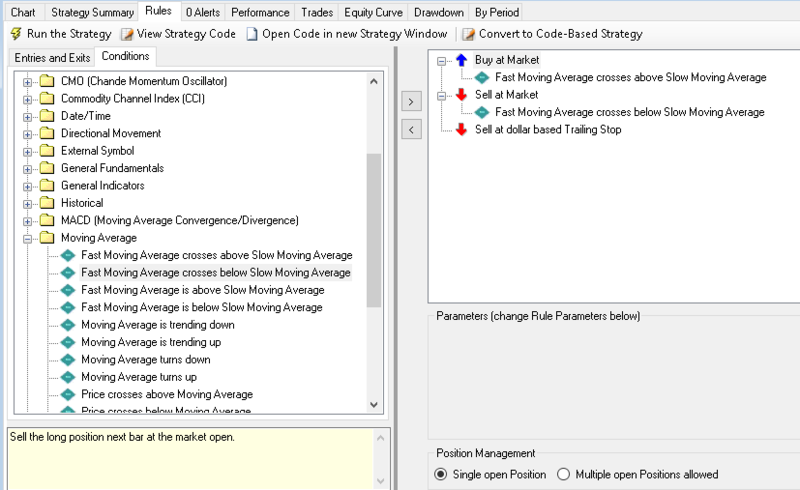 The "Golden Cross" system for swing trading by Ken Calhoun can be created entirely from the building blocks known as Rules in a drag and drop manner. Figure 1 illustrates the necessary conditions and the order in which they should be stacked. When you combine the rules as shown on the picture, the system will exit with a dollar-based trailing exit or after an opposite event - the crossunder of 50-day and 200-day MAs. Figure 1 is a guideline for setting the example system up in Rules with drag and drop. To add further interactivity, click nearby a parameter to expose it as "Parameter Slider". This way its value can be changed by dragging the slider on the bottom left part of the screen. When you run the system on the chart of a single stock (as opposed to a multi-symbol portfolio), Wealth-Lab automatically and conveniently applies changed parameters so you have a chance to see how entries and exits change interactively on the chart. On a closing note, to apply the system to stocks of a different price range you might want to either replace the rule with a percent- or ATR-based trailing stop or simply change the trailing dollar value. Figure 2 shows the system applied to a matching ETF (PFF).